Blowout Sale! 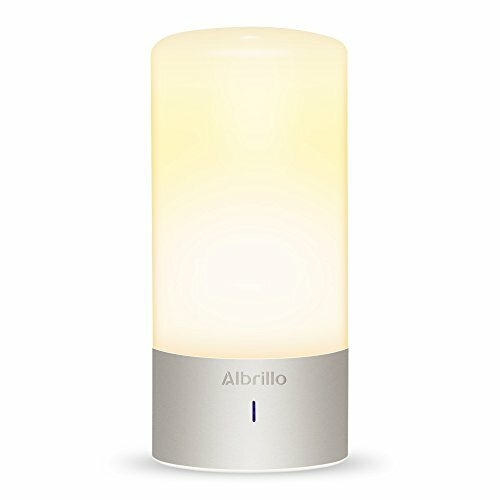 Save 51% on the Albrillo Bedside Touch Lamp, Dimmable Nightstand Small Table Lamps With Warm White Light and Color Changing RGB Modes For Bedrooms by Albrillo at F LED Lights. MPN: LL-AL-008. Hurry! Limited time offer. Offer valid only while supplies last. Relaxed eye-caring nightlight: This table lamp comes with white light mode and colorful rgb light choices. Relaxed eye-caring nightlight: This table lamp comes with white light mode and colorful rgb light choices. Ideal as bedside reading lamps, bedroom table lamps, living room lamps, desk lamp, modern floor lamps, nursery lamp, nightstand lamps, touch table lamps, end table lamps, bedroom lamps, etc. Easy to use(360° touch control): Plug and play. Tap the metal base anywhere to power on / off /switch light mode / adjust brightness / change colors as you want. Dimmable warm white light: The floor lamps can be set to white light for normal Usage, 3 brightness level (high-medium-dim) for your different lighting needs。 rgb color changing lamp: When powered on, long press for 3 seconds to enter into automatic cycle mode with 256 stunning colors, tap it again to stay on the current color. Intelligent design: This white table lamp stands 9" tall, space-saving , rated at 450 lumens for the ultimate ambiance and 35,000 hours lifespan. For everyone: For students in dorms, partygoers at celebrations, families at special events, children, kids bedroom and for relaxing,etc. It fits anyone and looks great everywhere. For any occasion: This touch lamps is ideal as a gift for any occasion. Christmas, birthdays, holidays, wedding, or anniversary, all call for long lasting and treasured gift or present. Specification: Brand: Albrillo light output: 450lm power: 6w max. (White light), 3w (rgb light) voltage: Ac100-240v，50/60hz, dc12v 1a, package content: 1 x led table lamp 1 x power plug( us ) 1 x user manual.